Either you are a collector or a seller of these types of gems, you need to know there are a lot of things to be taken into consideration when it comes to display and store them. Cases: these are an option for individual or collective usage as well. Either you want to display them as an individual piece, or in drawers, the case provide you the protection you need, as well as the possibility to exhibit the beauty of the gem, as they usually come with glass tops. Bags or jars: covered in foam or other protective material, this is a safer way to display your gems, without fearing they might accidentally break. Plastic containers: this is the inexpensive alternative, great for the collector and not the seller. You can use them in deposits to store the gems, but they do not make the ideal method of presentation for your clients. Chain Jewelry Displays are perfect for the display of any jewelry containing chains, bracelets, necklaces, pairs of earrings! They are great and very useful and keeping items of jewelry from getting tangled into each other. They are made of various materials, plastic, cardboard, metal, and they come in diverse shapes and sizes. The design of jewelry displays vary a lot as well. They are a lovely way of brightening up any environment, jewelry window case or store. They offer a helpful manner of keeping track of jewelry and also displaying them as well. They keep them well organized and in one single place, therefore avoiding risking to misplace or lose them. They are a wide range of jewelry displays and they can match into any kind of decoration so they are fit for any jewelry store. 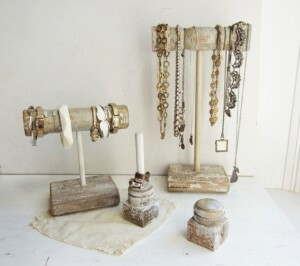 Chain jewelry displays can just as well be used for your own personal needs at home too! Body jewelry displays are a wonderful and amazing way to display jewelry items and they offer a kind of unique presence wherever they are placed. They are usually either body parts such as hands, arms, necks or heads or a complete body display. They are created in order to correctly display any kind of jewelry, earrings, rings, bracelets, pendants, tiaras or any other kind of jewelry item. They can be very imposing so they are perfect for attracting attention in the window case of a jewelry store. They can prove to be a very interesting and one of a kind manner of decorating and they will surely prove to be very attractive and captivating. This kind of display brings about a special type of elegance and sophisticated feeling and they help make any jewelry store look more inviting and authentic. They can also display plenty of various types of jewelry at the same time as well. Bracelet displays are chiefly designed to display bracelets and watches. 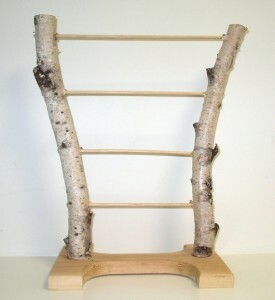 They usually contain either tiers or support or they are hand shaped. This type of display presents a nice and subtle touch in any exhibition set and they can be placed throughout the store pretty much anywhere, given their size and purpose. They are very elegant and highly sophisticated and also constructed with a very fine and smooth material. They manage to keep other items of getting tangled into each other as well. They are a great and efficient way of displaying bracelets since they take up almost no space whatsoever. 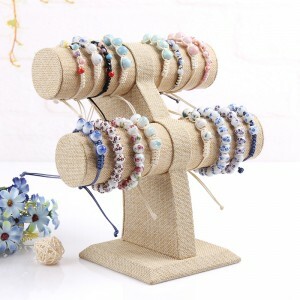 Bracelet displays can be just as readily utilized at home for your personal needs too. They are very easy to arrange and they can help create beautiful and intricate jewelry exhibitions, therefore they make for a really efficient and attractive method of portraying bracelets, watches and so on! 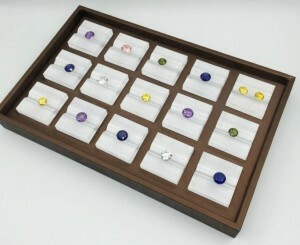 Ring displays are great for displaying a multitude of rings in one simple go! They can gather a huge number of rings and beautifully show them off before customers. This kind of display keep jewelry items safely organized and in one place, so they are very efficient and keeping them from getting misplaced or lost too! Earring and pendant displays are items that display both pairs of earrings and necklaces, so they are usually shaped in the form of a head or they are stands with multiples hooks, tiers and supports. They are an efficient and captivating method of jewelry display. They are sure to catch anyone’s attention and they make beautiful and charming jewelry store window case ornaments. They can be easily placed anywhere around the store or the house, if you choose to purchase them for your own personal use. They can accommodate pairs of earrings and pendants of various sizes and regardless of design. They are a lovely way of brightening up the place with a couple of jewelry items each and there. Earring and pendant displays are efficient, smart and they can prove to be very useful whenever you need to display either one item or an entire collection of earrings and pendants. Necklace jewelry displays are especially created to hold and display necklaces and any items of jewelry containing chains, such as larger bracelets and earrings. This kind of display aims to beautifully exhibit necklaces in jewelry stores. They can accommodate various kinds of necklaces, regardless of size and design. Necklace jewelry displays offer various kinds of designs and patterns; they usually are long and they have many holes and hooks to hang larger or smaller necklaces. Necklace jewelry displays are great at keeping jewelry items apart from getting tangled into each other and they manage to present them in a beautiful and efficient way. They can be a lovely and fine addition in any jewelry department store’s window case and they can be just as easily used for your own personal needs at home as well. They will arrange and decorate any environment and will beautifully display any type of necklace. Antique jewelry displays are a beautiful and unique way of displaying jewelry. They are preferable as they offer a certain charm of their own when displaying jewelry. It is a great idea to use them in any jewelry store’s window case as they will surely attract a lot of attention. They are gorgeous antiquities that will certainly appeal to any vintage lover. Usually, they are made of strong and resistant material such as metal or brass and they present fine and impressive patterns and motifs. They add a retro touch to any exhibition of jewelry and are definitely one of a kind. The use of antique jewelry displays is most suitable in a jewelry store as they beautifully combine and enhance the qualities of the jewelry they are displaying. Antique jewelry displays provide a completely new and alluring touch to any decoration set and are sure to catch any customer’s eye. This kind of jewelry display is the perfect way to add a touch of authenticity and finesse to any jewelry display exhibition. Vintage displays have a fascinating and interesting allure and they match with any kind of environment. They can be easily placed in the front window case of the store and they will prove to be very attractive. They offer unique, colorful and retro displays that cannot definitely go unnoticed. They portray fun and one of a kind shapes and designs and usually come in many colors. They present a lovely and enticing manner of displaying pieces of jewelry and can be readily placed everywhere around the store or even for you own personal use at home. Vintage jewelry displays offer a certain unique and captivating charm that is definitely hard to not remark and they are great examples of beautiful craftsmanship and traditional and retro items of decoration. 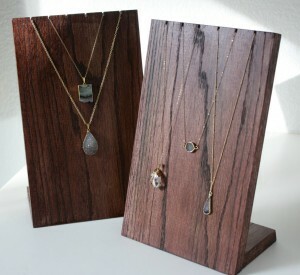 Minimalist jewelry displays are great for the display of jewelry items in a simplistic yet stylish and elegant manner. This kind of display is best suited for stores looking to present their products in a modern and simple way. Minimalist jewelry displays are ideal for showing off jewelry in window cases; they are beautiful and delicate additions among other types of jewelry display. They come in various styles and sizes and they can easily accommodate earrings, rings, bracelets, necklaces and so on. This kind of jewelry display is ideal for saving up space and using it as efficiently as possible. They don’t overcrowd and they can be a nice final touch to any kind of decoration. They can also be placed around the store for more effect. Given their minimalist design, their a perfect for your personal use at home as well and they are a beautiful and unique way of displaying jewelry. Modern jewelry displays are a beautiful combination of modern decoration and jewelry display. They, like modern art, come in multiple and diverse styles and colors and they usually stand out in a crowd. They are ideal for displaying jewelry in shops’ window cases as they present items of jewelry in innovative and interesting manners, therefore attracting passerby’s attention. They offer a wide range of tiers, stands, hooks and holes or supports in order to hang, organize and exhibit different kinds of jewelry. Depending on their size, they can display from rings and earrings to bigger items, such as tiaras and necklaces. Modern jewelry displays are unique and they aim to present their contents in completely new and entertaining ways. They can be used on their own or integrated into other jewelry exhibitions. Modern jewelry displays are great for both personal use and the display of jewelry in specialized department stores as well. Handmade jewelry displays are a beautiful and one of a kind way of displaying jewelry items. They are all created with the greatest care to detail and they all bear a special token of authenticity and are therefore different than any other kind of jewelry display. They come in many shapes, sizes, colors and style. A handmade jewelry display means a completely genuine and special manner of presenting jewelry. Their distinctive features will be the best way to attract anyone’s attention; they definitely stand out in any crowd and window case. They make for a beautiful and appealing jewelry exhibition and are ideal for displaying jewelry in a nonconventional and unique way. They can be meant for hanging jewelry, hooking pairs of earrings, or arranging various items of jewelry in gorgeous and enticing manners. They are true works of art and skilled craftsmanship and they will display your jewelry in a completely one of a kind way! It is all about your vision and creativity but here are a few ideas for you, in case you lack time. Painted twigs: very easy to make and eco-friendly, you just mix some colours together and then let your inspiration to the rest; ideal for necklaces, as they act like customized hangers. Pin them on a stand for more resistance and a pleasant appearance. Great for wooden and ivory jewels. Animal toys: if you like nature, and your jewelry inspire the same theme, then why not display them accordingly? Cut the toys in half and with some glue, stick them on a wood or metal board. And there you have your display. Ideal for colorful and bedazzled jewels. Painted wood and geometric designs: you can create amazing wall displays with some wooden boards and paint. You can use tape to mark the designs you want, as it provides precision. They look amazing with golden and silver minimalist jewels. It is also a plus when you offer something unique to your clients, something that is specific your brand, your style. It creates a personal connection with them and you will create and promote a name. How can you achieve that? There are many methods when it comes to personalizing your displays. Firstly you can design and print your logo, as well as detailed or intricate designs on them. They always have an impact. In the case of closeouts, pads or cards, which, beside of the actual presentation, the customer take them home with him, so it becomes a method of advertising as well. Another way of displaying your jewels in a customized way would be by using unusual objects as part of your display, as a central piece. One example could be the ethically obtained animal bones or horns (tip: those look amazing with wooden jewels or crystals) or abstract metal work that can be integrated into the finished design. It all depends on your style.